Manor Independent School District (ISD) has received statewide recognition from the Texas Association of School Administrators and Texas Association of School Boards (TASA/TASB) for the new Manor New Tech Middle School, an educational facility that promotes the values and direction of the Manor community. 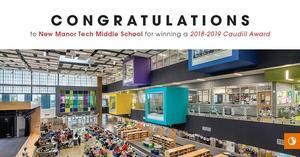 The new middle school was designed by Stantec Architecture and named to the 2018-19 Caudill Class, which is the highest honor awarded by TASA/TASB as it pertains to planning and design of Texas public education facilities. Manor ISD will be awarded this recognition at the Texas Association of School Administrator’s Mid-Winter Conference January 28. Manor New Tech Middle School serves approximately 700 students in grades six through eight and is the first middle school in the nation developed from the ground up with the New Tech Network (NTN) in mind. NTN is comprehensive school model that uses a proprietary learning management platform, tools, resources, training events, and implementation plans delivered by a team of coaches to enable school districts to reinvent schools with their local teachers through a multi-year partnership. The 100,000-square-foot, three-story facility supports a project-based learning (PBL) pedagogy, providing a unique environment where students can acquire the knowledge, skills, and attitudes they need to compete and succeed in today’s digitally connected world. “Manor ISD is honored to receive this prestigious award,” said Manor ISD Superintendent Dr. Royce Avery. 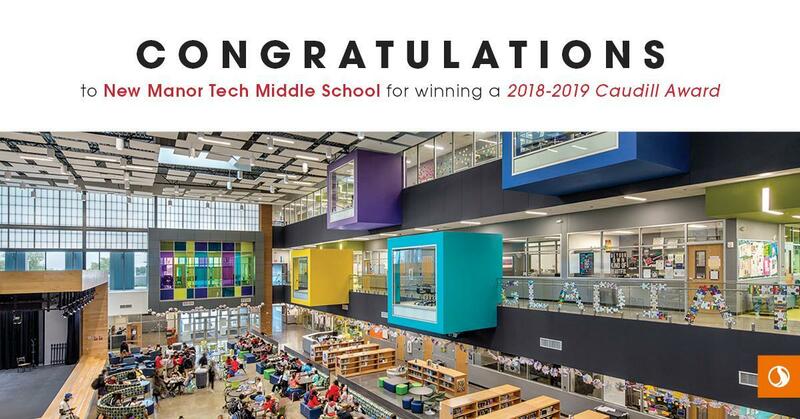 “We are truly proud of Manor New Tech Middle School and how innovative learning spaces, technology and hands on education is helping shape the young mind into the leaders of tomorrow’s workforce. New Tech Middle School embodies our vision of Manor being a destination district”. The school is designed around the life of a project, flowing from project launch and research, to workshops and assessments, to production and presentation. The three-story building features an open and transparent plan organized around a central hub, providing an environment that removes barriers, incorporates collaboration, and is rich in technology. The design encourages interaction through access to resources, allowing students to choose the type of space, furniture, and tools that best suit their individual learning style and ability to complete tasks. The school also allows Manor ISD to provide vertically-aligned PBL curriculum at all grade levels K-12. The annual juried awards program evaluates projects in six categories—community, design, planning, sustainability, value, and school transformation—and awards Stars of Distinction to projects that demonstrate excellence within each category. Facilities that receive four or more Stars of Distinction advance as finalists for the Caudill Class, and a second jury votes on eligible projects to determine the winner. Manor New Tech Middle School received Stars of Distinction in community, design, planning, value, and school transformation categories.